Haven't been in here in years!! Wasn't this known as the 'Best Little Horse House in London'??!!! Last time I walked in the landlord was just bodily throwing a rather irate customer out!!! Oh happy days!! Not the inviting place it formerly was. It seems the majority of the staff have left or are leaving. Thankfully there are a multitude of other Sam Smiths pubs around the area, but it�s a shame to see a fine pub with a happy team just disintegrate. 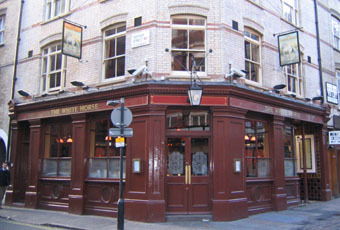 Disappointing really; Not one of Samuel Smith's better Central London pubs - lacks the old school charm of somewhere like the Horse & Groom or indeed the traditional, friendly localish feel akin to the Dover Castle. Also, no cask ale - whats all that about? Packed to the rafters on a saturday evening but still managed to get served reasonably quickly, so the staff deserve a pat on the back. Still, hardly one to go out of your way for. Been to this pub in the past and had pleasant pint reasonably priced and pleasant service. Visited again last week and apparently new landlord - dont know who needed the revamp most - the pub or the staff. I know the days of landlord wearing suit and tie in evenings are gone but when you get a very scruffy landlord in dirty t shirt and jeans bang two crates of beer on counter at 10 pm and start stacking shelves when customers are waiting - well to me that is not good customer service. Beer may be cheaper than surrounding pubs but would rather pay twice as much for better service - not a pub I will visit again.